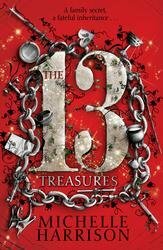 The 13 Curses is the sequel to the enthralling and captivating début book: 13 Treasures by Michelle Harrison. When fairies stole her brother, Red vowed to get him back. Trapped in the fairy realm, Red must beg an audience with the fairy court. There, she strikes a bargain. Her brother will be returned – but only if she can find the charms of Tanya’s bracelet, scattered in the human world. Returning to Elvesden Manor, Red is assisted by Tanya and Fabian, and a desperate hunt begins. Soon they make a shocking discovery. The charms now have twisted qualities of the thirteen treasures they represent . . . and the longer they are missing the worse the consequences will be. Can Red, Tanya and Fabian find all the charms? And even if they do, will the fairies keep their promise? 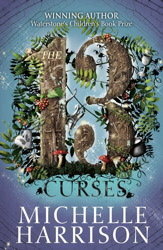 13 Curses, which is longer than it’s predecessor, delves deeper into the cruel, harsh world of the Fairy realm, where the Seelie and Unseelie courts rule. Red, whom we met in 13 Treasures, is the main protagonist, and makes for an edgier character that suits the sharper tone and style of this book. Red’s character is very prickly, and is of a much tougher nature than Tanya and Fabian, due to the loss of her brother and parents. Her journey to find her brother again, and of finding the 13 Treasures – now called the 13 Curses – makes for a very engaging read, but a bittersweet one. What impresses me the most about this series, is that it’s a beautifully written children’s story, but the dark natured aspects of the books shows that there are cruelties in life, and Michelle Harrison doesn’t hide these cruelties out of sight from the young teenager protagonists. I didn’t enjoy this book as much as the first. The unoriginal aspect of Red being an orphan, which enabled her to be a runaway for over three years, just struck me as a bit too convenient. But, nonetheless, I liked the overall story very much. Red’s character is explored much more in detail when the narrative switches from present to past. Her history, of how she lost her brother and her past family life makes for a very sympathetic character, though, one not as light-hearted as Tanya and Fabian. Red’s character had a lot gumption, and she had an edge of ruthlessness that was needed against the cruel and unfair nature of the faeries. Throughout the story, Red uses these characteristics to survive and to complete the quest the Fairy Court has requested. Especially once her brother isn’t the only one who is in need of rescue — when the Seelie and Unseelie courts drag Warwick, Fabian’s father, into their spiteful, mischievous games. Fair play is not part of the Court’s nature either, and I found them to have a chilling edge. I was glad to see that Warwick’s character, who is also a fairy hunter, be expanded upon – especially learning about the back story of father and son. Fabian and his father don’t have the best of relationships, and I would have liked to have seen a closer unity with them in this book, and was a tad disappointed when this wasn’t shown. Michelle Harrison has managed to weave a captivating story that showcases fairies and otherworldly beings in a much different way than other children’s books. Harrison’s fairies are not playful and light-hearted, but inhuman — dark, cruel, and spiteful. But the teenager protagonists balance it out with their big hearts, especially Tanya and Fabian – who despite knowing about the faeries and their ways, still had childlike qualities that I found to be very charming. I give 13 Curses 4 out of 5 stars. Thank you to Simon and Schuster Kids for sending me this book. Heh! 😀 I had that thought myself. I would have adored such a series — especially the concept of the fairy world — when I was younger, even if it’s a tad scary. So imaginative, and colourful. I cried when i read this book. its so sad when the truth about her brother comes up. I would recommend this book to any book lover, especially girls like me. I’m only at pg 63 and cannot wait to read more, this review has really helped me for my class assignment, thanks.